Artists of Yardley - Times Publishing Newspapers, Inc.
Artists of Yardley (AOY) is a non-profit organization, dedicated to nurturing the creative spirit of the community by educating and encouraging individuals to experience, appreciate and share in the arts. Established in 2004, we continue to grow with over 250 members, exhibiting professionals and all others interested in the visual arts. In 2010, AOY adopted the historic Janney House on Patterson Farm in Yardley, as their new home and art center. Located in the heart of Bucks County, the panoramic views of the surrounding farmland complement the organization¹s aesthetic tenor. AOY Art Center offers classes in all media, weekend workshops and summer camps for children and young adults. Their exciting and innovative programs are taught by professional-level instructors. Throughout the year, AOY hosts an array of opportunities for artists to bring their work to the public, including juried and non-juried shows along with indoor and outdoor fund-raising and social events. Their upcoming Eighth Annual Juried Show in April is open to all artists 18 and over. Following that popular show will be an exhibit in May featuring their own Faculty and Student works of art. In the fall, their Annual Members Show will feature exclusively the work of their Members in all media. AOY’s 10th Annual Fine Craft Show will take place the weekend before Thanksgiving featuring one-of-a-kind unique crafts perfect for holiday gifting and their famous and fabulous Bake Sale. The Artists of Yardley invites the community to participate and become involved in this unique organization! Their Member evening gatherings are lively and informative, a time to hear about what is going on with the group, discuss goals and plans, meet and get to know fellow artists and enjoy presentations by musicians, dancers and non-member artists who specialize in certain areas of art. 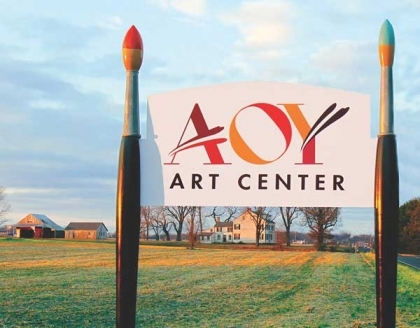 Their meetings are open to the public and held in the AOY Art Center, 949 Mirror Lake Road, Yardley, with dates posted on their website, www.artistsofyardley.org.